If a calf starts showing symptoms of pneumonia, early treatment greatly improves her chances of survival. According to the "Merck Veterinary Manual," approximately 20 percent of affected calves succumb to the disease even with treatment. Without treatment, nearly all affected calves die. Calves most frequently develop pneumonia between the ages of 2 weeks and 10 weeks, but it also occurs in calves up to 12 months old. Dairy calves, who are generally separated from their mothers shortly after birth, are far more likely to come down with pneumonia than beef calves, whose mothers usually nurse them. 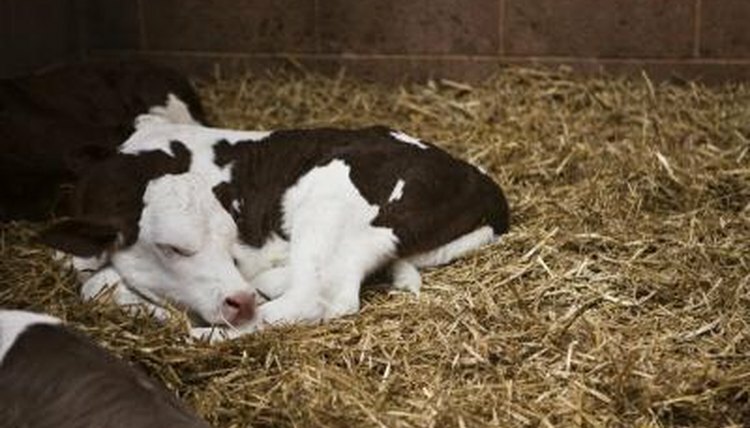 Calves raised indoors are more vulnerable than those raised in pastures or hutches. It's important to make sure that calves receive adequate amounts of colostrum, that first milk that provides protective antibodies. Some initial pneumonia symptoms are subtle, so keep a close on your young calves. Depression is the first sign of pneumonia, before any respiratory symptoms become apparent. Watch for droopy ears, head extension and isolation from the herd. Other indications include taking longer than usual to consume grain or to drink water. As the illness progresses, calves stop eating, develop breathing issues and run fevers. Calves also cough, and experience eye and nasal discharge. A calf's normal temperature ranges from 100 to 102 degrees Fahrenheit. A temperature of 103 degrees or higher indicates fever. Older calves often develop pneumonia not long after being shipped to a new farm or feedlot. Stressful situations lessen younger calves' resistance and increase the odds of developing pneumonia. These include overcrowding, putting new calves in an already established group, and feeding low-quality milk replacer. Feed a high-quality milk replacer, and avoid putting more than 10 young calves in a group. All group members should be approximately the same age. As soon as you notice pneumonia symptoms, contact your veterinarian, who will likely inject antibiotics into the sick animal. It's important to work with a vet rather than try to treat calf pneumonia yourself -- the calf must receive the correct antibiotic. For example, penicillin isn't effective against most bovine pneumonia. You must use an antibiotic approved by the U.S. Food and Drug Administration for use in animals intended for food. Make sure a sick animal receives high-quality hay and grain. Since dehydration often accompanies pneumonia, you might need to tube-feed water mixed with electrolytes into the animal.